On Sunday the Chicago Bears will make their first visit to Buffalo in over 16 years to take on the Bills. It’s one of the longest spans for a team not visiting another team’s home field. Chicago will have another favorable opportunity as the Bills are set to start their third-string quarterback Nathan Peterman. The focus for the Bears defense will be forcing the Bills quarterback to beat them by taking away Buffalo’s running game. Offensively, the Bills will look to control the clock and limit the number of times Peterman will need to throw. LeSean McCoy and Chris Ivory could be involved heavily in the running game, but also in the passing game with screen passes and short passes. Vic Fangio’s defense could utilize eight-man fronts to limit the rushing yards forcing the Buffalo’s passing game into long down situations. Inside linebackers, Roquan Smith and Danny Trevathan will be vital in employing this scheme. Sunday’s game could be a chance for Peterman to change the way he is perceived around the league as a quarterback. In his last three starts for the Bills, he has thrown seven interceptions and has yet to throw a touchdown pass. Peterman could be motivated to prove that he is better than his past performances and look to upset the Bears as evidence. If the Bears defense plays the Bills passing game soft and allows Peterman to build confidence and rhythm it could lead to them trying to make a game of it. With consistent pressure and turnovers early though, the Bears defense could add to Buffalo’s quarterback inept play. Last week, the Bears two biggest offseason acquisitions were held out of the game against the New York Jets with injuries and could be held out this week too. Wide receiver Allen Robinson’s absence was replaced with the production of Anthony Miller and Josh Bellamy who combined for seven catches for 74 yards and a touchdown. Linebacker Khalil Mack’s presence was missed as the Bears only registered one sack, but as a unit performed much better limiting the Jets to just 10 points on offense. Sunday in Buffalo, it will be important for members on both offense and defense to play strong again so Mack and Robinson can be fully ready for a stretch of three straight divisional games following this week’s game. One of the great things of playing the Bills in Buffalo is their passionate fans and their infamous tailgating. 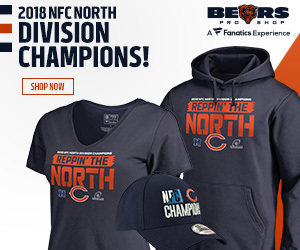 Their fans are truly dedicated to supporting their home team as creating a hostile environment has motivated their team to upsets in years prior. Quarterback Mitchell Trubisky can help silence the crowd by extending drives as he has converted several 3rd and long downs with his feet in the last two games. Allowing an opposing team to convert on third downs is a huge crowd killer along with consistent scoring. The Bills defense is still a respectable unit as they held the New England Patriots to just 12 points into the fourth quarter of their last game. If Buffalo’s defense is holding the Bears offense to field goals than it is imperative for kicker Cody Parkey to convert on all of his attempts. Parkey has missed field goals in two of the last three games, and leaving points on the field would motivate the hostile crowd. Visiting Buffalo is a rarity for the Bears as they have only played five on the road against the Bills since the two teams began playing each other in 1970. The last win Chicago had on the road in Buffalo came back in 1979 as Walter Payton scored the lone touchdown in a 7-0 victory. Since then the Bears have lost three consecutive games dating back to 1991. A total team victory will be needed from all three phases as in their last three losses either the offense or defense struggling led to the losses.